ERIS (pronounced EAR-iss) is the Greek Goddess of strife. According to most sources, she is the daughter of Nyx, Goddess of night, and Erebos, God of darkness, although Homer calls her the daughter of Zeus and Hera, twin sister to Ares, the God of war. Eris delights in causing trouble wherever she goes, and she is the last to leave the battlefield, soaking up all of the suffering that she has caused. It was an act of Eris that ended up causing the Trojan War--in revenge for not being invited to the marriage of Thetis, Goddess of the sea, and Peleus, a mortal, she cast a golden apple inscribed with the word "kallisti" ("for the fairest") among the guests. The apple was claimed by the three Goddesses Hera, Athena, and Aphrodite, and they asked Zeus to decide which one of them it should belong to. Not wanting to get into the middle of that particular argument, Zeus gave the task to Paris, a mortal prince from Troy. Each of the Goddesses tried to bribe him--Hera with power over all other men, Athena with skill in war, and Aphrodite with the most beautiful woman in the world--and Paris chose Aphrodite. Unfortunately, the most beautiful woman in the world, Helen, was already married, and when Paris kidnapped her (with Aphrodite's help), the Trojan War began. 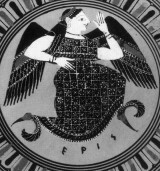 Eris is the mother of a whole host of evil spirits or Kakodaimones, including Lethe (forgetfulness), Limos (hunger), Ponos (labor), Dysnomia (lawlessness), Ate (ruin and recklessness), Horkos (oaths), the Algea (pain), the Amphilogiai (disputes), the Androktasiai (slaughter on the battlefield), the Hysminai (fights), the Makhai (battles), the Neikea (quarrels), the Phonoi (murder), and the Pseudologoi (lies). It was these Kakodaimones who inhabited the jar that Pandora later opened, releasing them into the world. Eris's name means "strife," and epithets used to describe her include HARD-HEARTED, ABHORRED, FRIGHTFUL, TERRIBLE, and DEADLY.